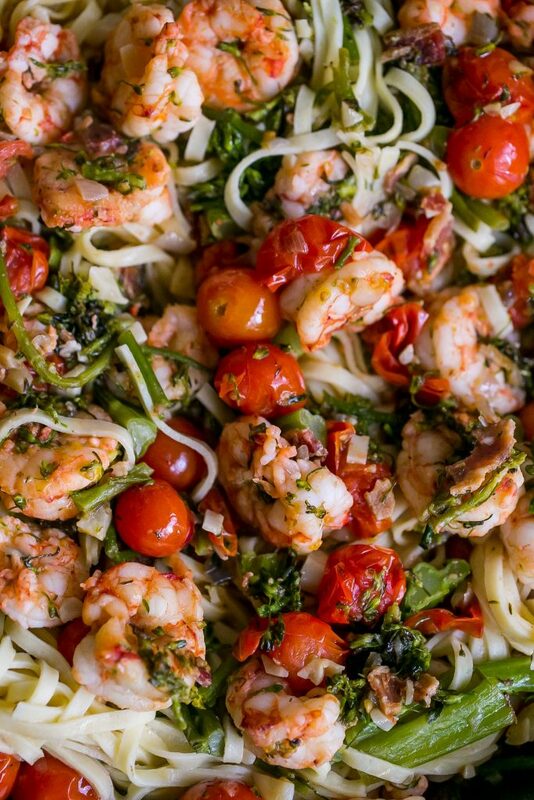 Delicious easy one pot tuscan shrimp linguine is full of flavor – great for dinner parties and perfect for beginning cooks! When I was visiting my parents in Baltimore with my kids, my mom was super sick one night, and didn’t feel like doing much- so I decided to make my mom and dad a nice dinner that she wouldn’t have to stress over. The only problem with my plan is that my dad is insanely picky. He isn’t a huge fan of seafood (which is basically all I want to eat when I am on the East Coast), but he does like shrimp as long as it doesn’t taste overly fishy. 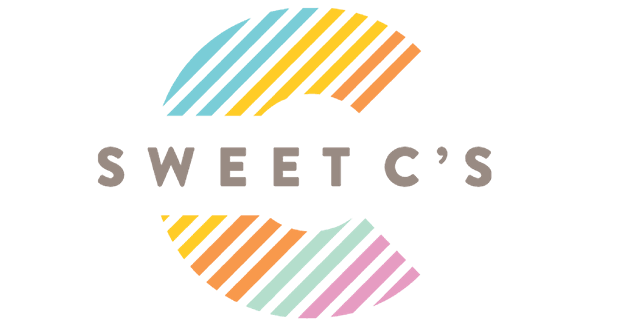 He’s also a bit picky about herbs and spices – so I have to be pretty creative when I am there to make something everyone will enjoy. 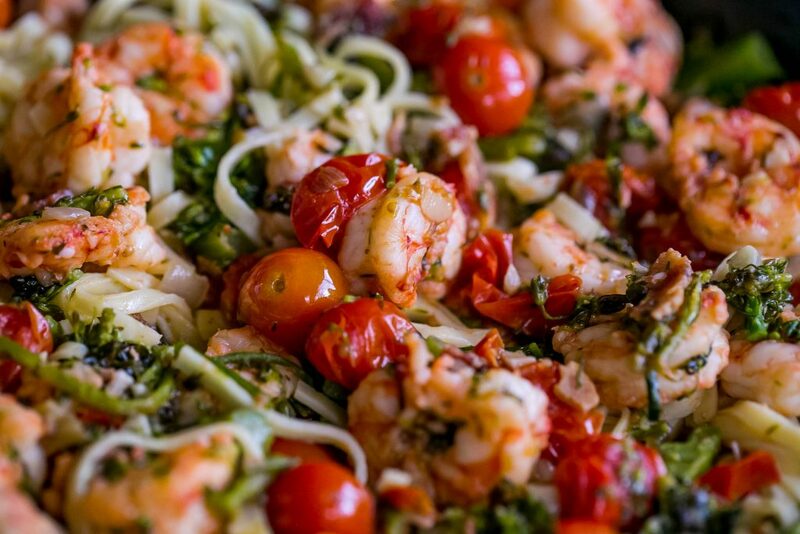 I had a pound of some beautiful Argentinian pink shrimp and some veggies and wanted to make a pretty pasta that wouldn’t be much fuss. 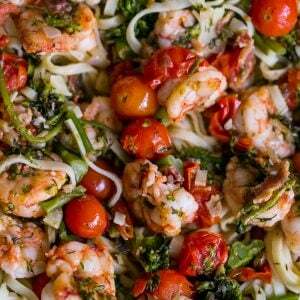 This One Pot Tuscan Shrimp Pasta has a ton of flavor, and is crazy easy to make- and is a big hit with even picky eaters. One of the biggest mistakes people make when making shrimp is overcooking them. 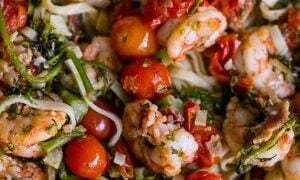 When shrimp are overcooked, they get gummy and can taste really, really fishy. By adding shrimp just at the end, you can be sure the shrimp is cooked- but not overcooked. This dish has a nice sauce from butter and wine – if you[re concerned about cooking with wine, go ahead and skip it and switch it out with some chicken stock. I like using a dry vermouth, but any dry white wine will work – just be sure it’s one delicious enough to drink! You don’t want to use wine that isn’t a flavor you like in a dish with such few, simple ingredients. 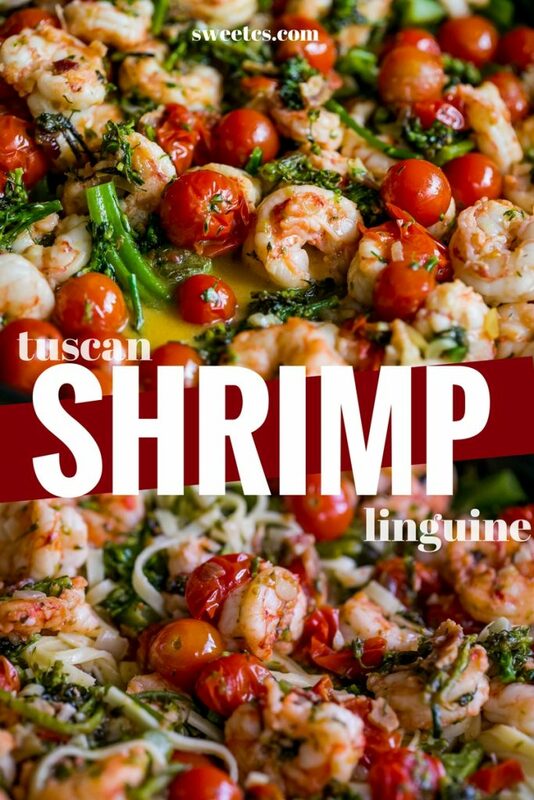 Delicious easy one pot tuscan shrimp linguine is full of flavor - great for dinner parties and perfect for beginning cooks! Place half the butter and olive oil in a large pan, heat on medium high until hot but not burned. 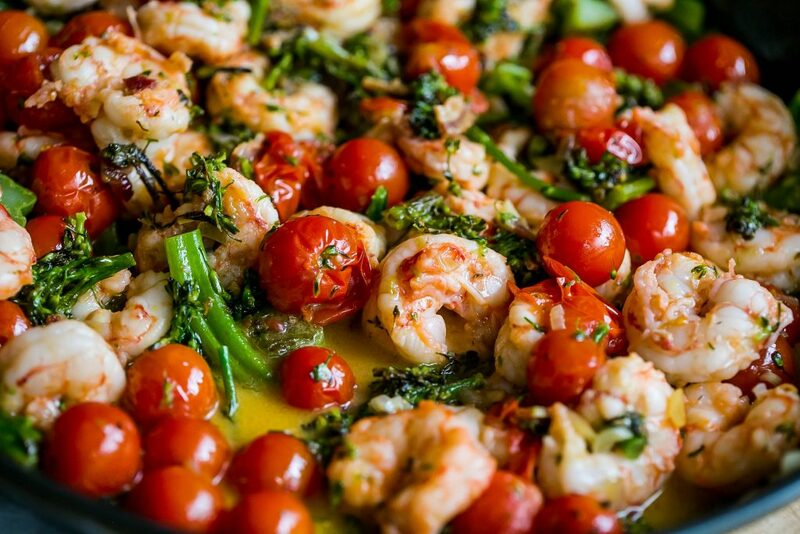 Add onion, broccolini and tomatoes to pan. Heat until onions and broccoli are slightly browned and tomatoes pop and wilt, stirring often to prevent burning. Add wine, stock, and garlic to pan, stir to melt butter and help form sauce. Add shrimp to pan and stir to coat and cook. Let linguine cook in sauce until soft, another 5 minutes. 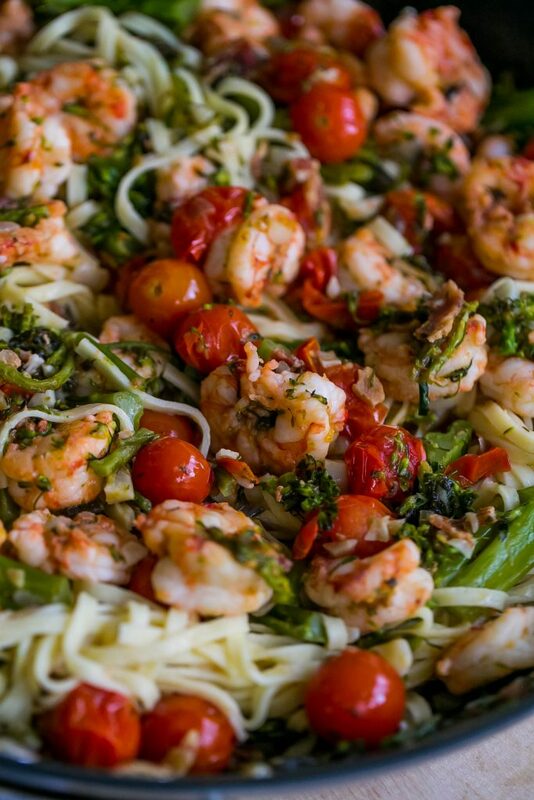 When linguine is soft and shrimp is opaque, remove from pan and serve immediately. Top with fresh grated parmesan if desired.